Yeah, right. Obama — the guy under whose watch Congress increased the debt by 50% — is now the fiscal conservative? The problem with all of this is that this is based on projections and models and not on that troublesome thing called reality. The economy is a complex, non-linear, multi-dimensional thing. It is a seething, writhing mass of humans, animals, weather, markets, desires, processes, and ideas, and modelling that is (at very, very best) troublesome, or at worst impossible. All of these projections could be wildly and completely wrong. And these bozos have been completely wrong before. Although OMB and CBO used quite different policy assumptions, both foresaw surpluses starting in 2012 — CBO projected a surplus of $87 billion for 2012; OMB projected a surplus of $48 billion for 2012. Whereas — back in reality — we have a deficit of $1.3 trillion. So they were only (roughly) $1350 billion out. That’s only 2700%! It’s something of an understatement to say that we should treat such predictions with extreme scepticism: the kind of scepticism you’d treat, say, an unsolicited e-mail from the Crown Prince of Nigeria telling you that he needed help getting $2 billion out of the country, and offering you a $10 million slice if you can send $2,000 up front by Western Union. 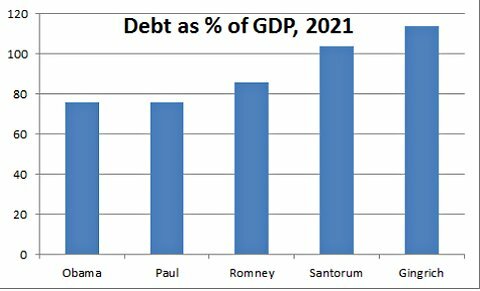 So it remains true that all of the proposals, except maybe Ron Paul’s would lead to higher deficits than Obama, based on a common assessment. Okay. I still don’t buy the numbers, but did Paul Krugman just admit that the best hope for cutting the Federal budget deficit is Ron Paul? This entry was posted in Current Affairs, Politics and tagged budget deficit, paul krugman, reality, Ron Paul. Bookmark the permalink. I think so. But the MSM crowd would hear “Deficit” and interpret it as rydididideevv. So it does not matter. BTW I think the US Government knew the GFC could produce a lot of disgruntled investors. CIA speak – Potential Terrorists. Because most investors have a buy and hold hopium strategy, they are not feeling the threat from investors like they did in the middle of the GFC. I see a lot of radical bloggers on various sites. I am in two minds if they are real or trolls fishing for leads. I mean if you had a Government Job, an account with Zerohedge, you could fish all day. I concluded that after OWS fizzled, 99% of negative bloggers are on the Government payroll. And it goes a long way to explain why employment numbers have held up. I have no idea what the answer to any of that is, but my gut says most of the angry trolls saying inflammatory things on the web are disgruntled kids. Krugman has been proven right, where the Austrian school has been proven wrong. Where’s the hyper-inflation you guys have been promising us? How about the expansionary austerity? With coprporate profits at record highs, where are all those new jobs which their investment’s going to bring? You Austrians are living in a delusional dreamworld, and the results of the last few years ought to have made you change your opinions. Unfortunatelly, well educated, intelligent right wingers are not actually able to change their minds when the facts change. By contrast, smart leftisits and centrists are guided by reality, not ideology. Thats a really crucial phschological difference. Where did I promise you hyperinflation? Economics is not a shouting match between different schools and different ideologies, where one group of people are right, and all the others are living in delusional dreamworlds. Economics is about examining evidence and trying to tease conclusions out of that data. Krugman’s conclusions on this particular topic are still based on a load of projections that aren’t worth the paper they’re written on. I don’t know what the ultimate deficit end-point of any particular Presidency or Congressional regime will be; it depends on a multiplicity of factors, many of which are hidden, many of which are serendipitous. I suspect that Ron Paul’s plan — of cutting militarism, corporatism and bailouts and redistributing the money back to the taxpayer — would be the most effective, but that is just my opinion. I don’t think that Synopticist guy will be coming back. He offered no argument on the issue at hand, just ad hominem insults. Krugman’s a genious, and the Austrians have been proven wrong. Why not address Aziz’s points instead of throwing off blanket remarks about entire schools of thought? How much do you want to bet it’s because the revenues predicted from Obama are much, much higher than revenues than are predicted for our Republican candidates under the “CRFB Realistic Baseline” http://crfb.org/document/primary-numbers-gop-candidates-and-national-debt pg 11. Ron Paul cuts 9% off of that – this is the deficit baseline model that is much more pessimistic than “current law” (which I think means Obama’s current projections, maybe???) see page 10 of that same link. Looking at the data it appears that debt to GDP levels (public debt net of financial assets is what I think they’re talking about) is something like 65% – close to Krugman’s Obama number. 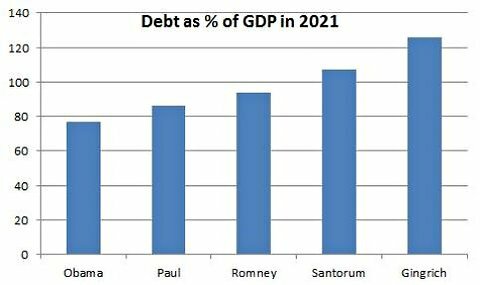 If we were to take Ron Paul’s proposals and slice off the same % debt/GDP from that baseline, he’d be at 56%. Slicing it off from the Krugman number it’s be about 58%. Krugman, either I’m wrong – somehow, you’re a liar or you’re careless. As to what Krugman deserves if I’m right. At any rate, there’s so way Obama’s projections would lower the CRFB to 67% debt/GDP or whatever the number is. Krugman is being very deceptive. here it is – so the baseline does include somethings Obama would get rid of like – continueing Bush tax cuts, but Krugman needs to compare apples to apples – using this baseline. Otherwise, his whole chart is null and void. of course, I still don’t think its apples to apples because to be a true apples to apples comparison the CRFB should show the % change of the debt/GDP ratio in 2021 using the Obama baseline – not the “realistic” baseline. We don’t know how that’d turn out. In other words, it’s just assumed for the Republicans that they start on this “realistic baseline” and they have to start cutting from there – when the analysis should focus on how much more expensive or inexpensive their proposals are relative to Obama’s…. I’ll try to stop posting now. Thanks for the input, Andrew. I just dismiss this kind of vague prognostication Krugman is guilty of on philosophical grounds. It is nice to get some portrait of how bent the statistical methodology seems to be.